Reams and Papio Valley Nursery are were excited to host the 2016 Pro Irrigation and Landscape Show. This year's show was held on Tuesday, February 16th at the La Vista Conference Center in La Vista, NE. 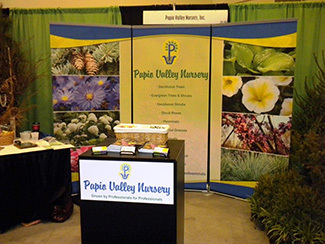 We put together an event where customers were able to visit with the industry’s top vendors, leave with fresh business ideas, and be brought up to speed on all the new products available from Reams and Papio Valley Nursery. "Time spent reviewing new plants with vendors was most beneficial!" "It was refreshing to be at a show that did not rehash what everyone already knows." "It was a really diverse show as far as speakers. I also liked how it was directly tailored to landscape installers." "We did enjoy our day! For me, I think Lisa's (Lackovic) talk on sales and women was fantastic. Her presentation was very helpful to me as a sales person. Also, I enjoyed the perennial presentation. Again, as a sales person, I liked hearing about and seeing new things. Lastly, the networking aspect of the show. There were several booths there that we have a long working relationship with. It's always good to reconnect with people we've worked with in the past." "The classes were very informative especially the new information on irrigation. The sections on perennials and viburnums were also very informative, as they gave all of us new ideas for different plants to use this spring. Also, the food was great." "(We) really enjoyed attending the Pro Irrigation and Landscape Show. It was nice that it was offered at no charge, certainly made it an affordable option to bring employees to. Everyone takes away something different from a show like that. We enjoyed the seminars, they were attractive to a wide variety of people (especially the landscape track)." "I especially appreciated the technical training seminars. Anything that improves our expertise will improve our companies." "I really like the perennial speaker (Jayne Roberts). She gave us good insight quickly through that massive list and she was humorous." "One of the things I liked best about the show was the amount of attendees. A good amount of those were trees & shrub people. Setup was easy as well as tear down. Lunch was fabulous."